Miranda Lambert, Brandy Clark, Margo Price, and Sturgill Simpson had the best albums of 2016, according to the annual Nashville Scene survey of country music critics. In addition to those Country Universe favorites, critics also embraced the Dixie Chicks, who charted high on the list of Best Duo/Group and Best Live Act, and ranked well among the year’s best singles for their “Daddy Lessons” collaboration with Beyoncé. Country Universe writers Jonathan Keefe and Tara Seetharam voted in this year’s poll, and two of Keefe’s comments were showcased as well. “Different for Girls” is three embarrassing minutes’ worth of mansplaining in which J.T. Harding, Shane McAnally and Dierks Bentley try to prove their sensitivity and empathy by rattling off a list of antediluvian gender stereotypes that deny women’s agency. So, of course, it was a No. 1 hit while Miranda Lambert’s “Vice,” which plays out as a direct rebuttal, stalled at No. 11. Did the popular press overstate the country influence on the version of “Daddy Lessons” from Lemonade? Certainly. Country signifiers figure into the song, but not as prominently as, say, Dixieland jazz. But the collaboration between Beyoncé and the Dixie Chicks on both their live and studio versions of the track greatly magnifies its country influences, to the extent that it works flawlessly when they interpolate the bridge from “Long Time Gone,” the Dixie Chicks’ rootsiest and best single. Did Beyoncé deserve consideration for Female Vocalist of the Year at the CMAs based solely on “Daddy Lessons”? Absolutely not. 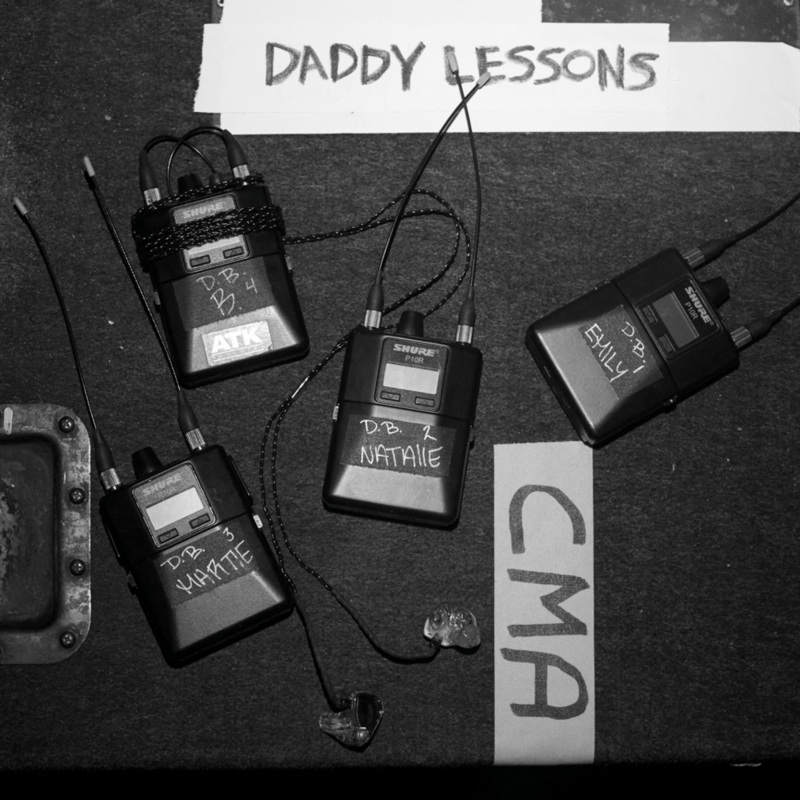 But if the studio recording of the collaborative version of “Daddy Lessons” were to figure into the Grammy nominations in either the Country or American Roots fields, that would be well-deserved. “Right before I moved to Nashville, women were all over country radio,” Clark says. “Now, not so much. That was one of my favorite times in country music: when Patty Loveless, Trisha Yearwood, Wynonna, Mary Chapin Carpenter and Kathy Mattea were all getting played. I don’t know how we went from that to just two women on the radio. There’s definitely a disparity there. But I feel we’re inching back to where we belong. I also saw that The Complete Trio Collection was ranked #1 in the Reissues category (the third CD of heretofore unreleased material was likely what clinched it), which is a great thing too. All in all, it was great to see a lot of great women on this list. Now if this can be transferred to radio airplay…. In her interview, Clark mentions the time when Patty Loveless, Wynonna, Trisha Yearwood, Mary Chapin Carpenter and Kathy Mattea were all being played regularly. I agree with her that this was a great time – for both female artists and listeners. But for me, the problem is that all these ladies she mentioned managed to connect with country fans. Most of today’s female singers have a small core audience that loves everything they do but they’re not connecting with anyone outside of that core. So many of them are writing their own songs all while winning applause and awards for doing so. But it’s not translating into sales or airplay. I think it might be in their best interests to include self-penned songs on their albums, but maybe go to other writers for some potential radio hits. Even the great Dolly Parton began doing this in the 70s and her career exploded afterward. Miranda Lambert waited for years to hit #1 but it didn’t come until she released House That Built Me, which was written by someone else. I also don’t think today’s female artists are connecting with a lot of the women. The men seem to know how to connect with both genders, but the women don’t seem to know what their audience is wanting. And they don’t seem to be willing to stretch outside their comfort zone to find it either. The music business is hard and it’s unfair. If you look back over the decades, there’s no telling how many great artists never had any success at all. Some of it’s timing, some of it is finding the right song or producer, and some of it is just pure luck. Twenty years ago, someone like Easton Corbin would’ve been a superstar. But today, he’s struggled trying to be himself as an artist and having any success with today’s country sound. I think the pendulum always swings back. And as Clark says, it is getting a little better for women. But they may have to take some uncomfortable chances if they want to find that song that brings them an audience they can build on. Once that happens, I feel sure that that audience will then see what they’ve been missing. To your point about women taking uncomfortable chances in finding songs that bring them audiences they can build on, I agree to a large extent. But I believe that the most uncomfortable thing they could do is to reduce themselves to the level of the frat-boys and Bromeisters to get those hits. They are walking a fine line, of course; but I’d rather see them make great albums that sell reasonably well than to just see them have “hits” that, in content, aren’t any better than anything else on the radio. Erik, I can see how you could interpret what I said that way. But no, I’m in no way suggesting they reduce themselves to frat-boy music. Both Dolly and Miranda chose great songs when they went to other writers. Dolly was particularly nervous about Here You Come Again and insisted on adding steel guitars to the song to make it sound more like her. But what I’m suggesting is finding a quality song that will appeal to a bigger or different audience so they will buy the album and then discover the self-penned songs. The issue isn’t women finding quality material. It’s systemic sexism. When the radio cycle lengthened at the turn of the century, significantly reducing the number of songs that received heavy airplay in any given year, women disproportionately were removed from playlists. This happened in spite of commercial success, not because of the lack of it. Artists like Shania Twain, Faith Hill, Lee Ann Womack, Dixie Chicks, SHeDaisy, and Alison Krauss sold far better units with less airplay than the men who were getting a lot of airplay. Even today, with Miranda Lambert consistently topping the sales charts, year-end lists, and dominating award shows, she still doesn’t get consistent airplay. She’s always sold better than her ex-husband, yet he has 23 #1 hits and she’s only visited the top ten of the airplay chart eleven times, one of which was a collaboration with a male artist who always gets airplay (Keith Urban.) Just look at the difference it makes to include sales, the obvious measure of actual popularity: “Vice” would’ve peaked at #11 if the singles chart was airplay only, but it ended up a #2 hit because it sold so well. Same deal with “Follow Your Arrow,” which powered Kacey Musgraves’ debut album to gold, but would’ve been a #43 hit instead of a #10 hit if the chart still went by airplay only. If all of the artists listed from the nineties – Trisha Yearwood, Mary Chapin Carpenter, Patty Loveless, Kathy Mattea, etc – released the same music today, they’d be in the same conundrum: topping critical lists but having limited commercial success because of limited radio exposure. These female artists are finding their audience in spite of obstacles. They are not their own obstacle. For that to be true, you have to assume that the playing field is even for male and female artists, despite overwhelming evidence to the contrary.